Cyprus is the third largest island in the Mediterranean. The northern part is Turkish; the southern is the independent Republic of Cyprus. Her most famous dive site is the wreck of the Zenobia, which is currently rated one of the best dive sites in Europe and one of top ten wreck dives in the World. 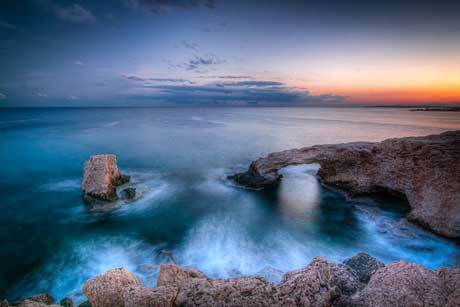 The island of Cyprus is south of Turkey and west of Syria, one of the most southerly islands in the Med. Sea temperatures range from 17 oC in February to 28 oC in August. The warmest water temperatures are from June (24 oC) to November (22 oC). The diving season runs from March (although it's cold then) until November: one of the longest diving seasons in the Med. The weather is sunny most of the year. You will need cash for petrol stations and smaller tavernas, but can get that out on a debit or credit card from any ATM. Foreign credit cards are readily accepted. If you need to contact the emergency services call 112. Make sure you have diving insurance before you go. New: Lionfish have invaded the south coast of Cyprus. 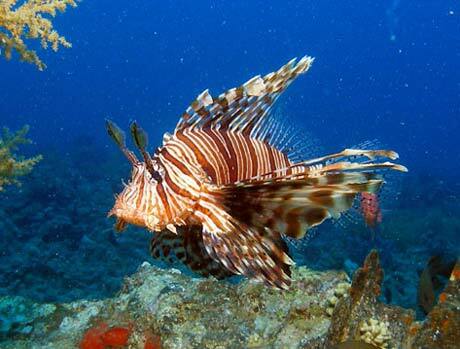 Scientists are asking divers to remove the lionfish if they see them. More on the lionfish news. Lionfish by by Tim Nicholson. The MS Zenobia was a roll-on roll-off ferry which launched in 1979 and sank in 1980 on her maiden voyage. No lives were lost. She lies on her side, outside Lanarka harbour. The dive starts at 16 m with a maximum depth of 42 m. A large wreck: you will need several dives to do it justice. The Zenobia is rated one of top ten wreck dives in the world. "Rightly listed as one of the best wreck dives "
"We did 4 dives, with the excellent "Dive-In" dive centre at Larnaca, Cyprus, on the wreck of the Zenobia. This 178m wreck sank in June 1980, and the passage of time together with local regulations prohibiting fishing around the wreck have led to a surprising amount of marine life. She now rests on the sea bed at 42m, with the top of the wreck around 20m. I'm not normally into wrecks, but this one's pretty special. " "One of the best wrecks in the world and the guys at dive-in know how to show you the best parts. Surprising amount of fish here. " "The pristine wreck of a huge ro-ro (roll on, roll off) ferry. Lies in 40 m just outside Larnaca harbour in Cyprus. Lying on its port side, so you hit the wreck at about 15 m, it goes all the way down to 42 m. Fabulous, fabulous dive. Probably the best shipwreck dive in the world in recreational depths. 20 m plus visibility and some great swim-throughs. Vast wreck, simply enormous. Needs at least 10 dives to see anything like all of it." "Only completed 2 dives on this fantastic wreck but will be returning next year for a full week's diving on it so that we can explore all the areas available to us! The Zenobia dives are well worth the overall cost of the holiday. " "A 172 m long cargo ship that sank in 1980 about 1 km off the south south east of Cyprus. An excellent penetration dive. " "Have done more than 200 dives there, never bored of it and always with new things to discover. If it was located in Red sea It would be top ten for sure." "Fifteen minutes away from Larnaka harbour by yacht: very impressive with great visibility. Will go again and again. " "Amazing technical dive. Massive wreck with loads of little holes for penetration. too big for just one dive. " "What a wonderful wreck and a great day out, not to be missed. Look forward to diving it again very soon. " "What a wreck. It is huge and very impressive with more life in that one spot than the rest of the island put together "
"Most spectacular, astonishing and relaxing dive. You see so much, you almost forget to check your manometer. As already said terrific divethroughs for almost every diver level (allthough I'd say Padi advanced open water and upwards would be a recommendation) and there's so much to see you need more than 1 or 2 dives to see it all. Have you ever tried feeding the fish? " "This wreck is massive. It needs to be dived more than a couple of times to really appreciate how big this ship is. 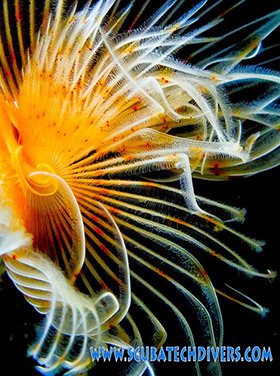 Great visability and sea life. The Zenobia is by far the best wreck dive I have done to date. " "Superb! Even for a group of UK tekkies! " "Deep site (40 m+).Saw some squid and a ray "
"Not much life a this one until the end of the dive when we saw a group of big squid. Typical we didn't take the camera when we needed it "
"A great walk in dive site. lots of fish and a good place for a refresher or for learning to dive "
"A walk in site that served as a perfect shake out dive. Mick and his assistant Instructor Paul (Dragon Divers), carried out scuba reviews for the whole group. With swimming pool like conditions that fan out into open water, this is an amazing first dive to get you back into things. " "Great for beginners. easy swim around and loads of fish for feeding at 3 m with statues sunk for the divers at 10 metres." "A very pretty site although like most of the med sadly lacking in fishlife"
"Great swim throughs and the visability is wonderful. Water warm too, perfect!" "Mick (Dragon Divers) explained that this was one of his favourite shore dives in the area and we can see why. To dive into caves and see marine life that you only normally see at night was awesome. Shrimp, crabs, octopus to name a few "
"The newly sunk Kerynia wreck in Ayia Napa is a great training platform for those that wish to learn everything about wreck diving. The wreck offers penetration in 4 areas, its easy to navigate and is a great practice platform for beginers." "On sunny days a brilliant reef dive from 2-30 meters (beyond that there is only grass). Has a wall to approx. 32 m with much tropical fish swimming around "
"Big groupers, steep walls and some caves. The water temperature never goes below 16 oC and is 21 oC in June. Cyprus is famous for groupers and turtles." Review a dive operator or list your diving company on this page. "I dived with Scuba Tech Diving Centre in Cyprus and they were a fantastic outfit. The guys couldn't do enough for us. They offer TDI and PADI TecRec and Pete is even an ISC Megalodon Rebreather Instructor. Pete did me a rebreather try dive on the meg too, which was amazing...a real way to challenge yourself if you have been diving for a while. My kids did a Discover Scuba Diving and I couldn't have put them in safer hands. We did lots of Shore diving, but i have to say that the best dive I did was the Zenobia. What a wreck. It is huge and very impressive with more life in that one spot than the rest of the island put together. The service from the guys at Scuba Tech made this one of the best diving holidays I have had. And the Zenobia was the massive cherry on the top "
"Rob Jones and Pete Crane couldn't do enough for us. An excellent service and we'll certainly be back again. Better than Red Sea Tek operators I've dived with. Cheers lads!" "Dived with Peter and Shelley at Scuba Tech Diving Centre. Small Groups, decent dive times (no dive less than 60minutes) and free nitrox gave real value for money. The Instructors are happy to give advice and spend time explaining different things. Got my regulators serviced too. Would definately recommend this outfit to everyone "
"Spent a week diving with Dragon Divers and true to their motto we had plenty of fun. The diving ended up cheaper than most places due to the discounts offered on multiple dives and group discounts. For only �100 euro we received road and boat transfers from Protaras to Larnaca to complete 2 dives on the famous Zenobia Wreck and both dives were awesome! What a wreck. Dragon's staff were professional and friendly in every way! Awesome week, dives great, beaches great, food plentiful, see you next year Dragon Divers! " "Very friendly and professional centre. Would definitely dive with them again. Stayed at the dive centre's apartments in Pernera. Fantastic location, just being minutes from the shops and the beach. Excellent value for money"
"Had a truly excellent time diving with Absolute Scuba. They were professional and above all else, safe and fun. Great facilities and a big thank you to Roger for all his patience! See you again soon." "The newly sunk Kerynia wreck in Ayia Napa is a great training platform for those that wish to learn everything about wreck diving. The wreck offers penetration in 4 areas, its easy to navigate and is a great practice platform for beginners. The visit to the wreck is by catamaran from Ayia Napa harbour"
"Dive-In Larnaca are a first class operation. I did a week's recreational diving with them and thoroughly explored the Zenobia wreck as well as having a fun day out at 2 shallow sites near Agia Napa. Good value for money - they dive in small groups and all the guides are PADI Instructors. " "Well run and professional outfit. IDCs and Tec diver training done here both of which I attended and were very well done. Yurg is an outstanding professional CD. Excellent value for money. " "I dived with Scuba Cyprus who are outside Kyrenia , great guys with some good reefs just 5 minute rib boat ride away with some big grouper and amberjacks about also the occasional turtle in the hotter months "
"Erkan and Azim and the rest of the staff are fabulous. Some good deep dives - thermoclines after 18 metres - big fish too - great dive centre - and will dive again there for sure"
"Stayed at Louma apartments. Great rooms, newly refurbed with a lovely pool ad perfect location 2 minutes walk from the beach and the town. Great personal service from Geoff and Sheila at the Pool Bar. A great place to stay. Lovely apartments at budget prices "
Cheap holiday deals to Kyrenia; book hotels, flights or whole packages. Compact, photographic, guide to 289 species. by Helmut Debelius, 2003, hardback. by Grzegorz Micula and Magdalena Micula, 2012. Send us your comments on Cyprus. Do you want to recommend a diving centre or dive site? Let us know. If you own a dive centre get yourself added.